Timothy Artman/TeslaThe Tesla Model 3. Morgan Stanley analysts Adam Jonas expects Tesla to deliver 8,000 Model 3s in the first quarter of 2018 and raise that 46,000 by the end of the year. No other automaker has so many people scrutinizing its ability to do something as fundamental as build cars. Delivery-fixated observers could miss some bigger questions about whether the Model 3 can be profitable. On balance, Tesla is closing out 2017 in defiantly counterintuitive fashion. The company is losing more money than ever and struggling to deliver its Model 3 sedan in volume, but the stock is still up a whopping 59% year to date. Much of the upward move on Tesla’s market cap in 2017 can be chalked up to elevated expectations for the Model 3. And as Tesla fails to get the cars into owner hands on schedule, everybody on Wall Street, in Silicon Valley, and in all lands in between has fixated on how many Model 3s will actually hit the streets in 2018. 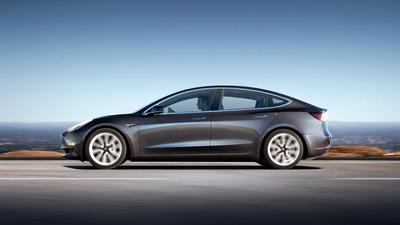 In a research note published Friday, Morgan Stanley analysts Adam Jonas predicts that Tesla will delivery a pretty unimpressive 8,000 Model 3s total in the first quarter in 2018, but he raises that to 46,000 by the fourth quarter. That would translate into Tesla’s best-ever year, assuming 100,000 or so Model S and Model X deliveries, but it would still fall well short of CEO Elon Musk’s own goal of 500,000 for 2018. Elsewhere, speculation is rampant about Tesla’s impending surge of Model 3 deliveries, with completed cars waiting at delivery centres and Tesla’s online configuration tool opening up to new owners who have placed pre-orders. I’ve covered the auto industry for a long time, and I’ve never seen anything even remotely like this. It’s almost as if Tesla has been playing baseball for 14 years and suddenly figured out how to hit the ball past the infield. Countless Tesla pundits are now trying to figure out if the company can hit .400 in 2018. Nowhere else in the industry would this happen. For example, General Motors announced its Model 3 competitor, the Chevy Bolt, in 2015 and had the car rolling off the assembly line by late 2016. GM just sold 3,000 Bolts in November. Nobody is sussing out how many Bolts GM will sell in 2018; it could be 3,000 a month, or it could be more, depending on how much demand the carmaker sees. If it thinks it can sell 10,000 a month, it will simply … build 10,000 a month. This is what we often worry about with the auto industry – that carmakers will overproduce. We worry because carmakers can easily overproduce. Tesla has something north of 400,000 pre-orders for the Model 3, and if Jonas’ numbers are good, it will end 2018 with 300,000 of them unfulfilled (he’s estimating about 50,000 Model 3 deliveries in Q2 and Q3). If another automaker found itself in that position, it would be an absolute catastrophe. But it wouldn’t happen because if a GM or Toyota had 400,000 pre-orders for anything on the books, those cars would be getting built and built fast. It’s a given. Nobody thinks about a major modern automaker’s ability to handle something as fundamental as building cars. Tesla’s manufacturing weakness is glaring and baffling, and that’s why Tesla watchers are spending so much time drilling down on Model 3 production. What we really should be witnessing is Tesla building the Model 3 at something resembling GM’s Bolt pace, then crunching the numbers on whether Tesla is actually making money on the car or just seeing the Model 3 elevate its top line and its cash flow. Ideally, even if Tesla sorts out something that everybody else has already sorted out, we’ll continue to look at actual market dynamics of the Model 3. But I suspect that instead, Tesla will get a bump in confidence as it masters the base hit, even as the traditional auto industry continues to drive home the runs.